Quinn LaPointe returns to Butternut Lake ten years after the unexpected and tragic death of her then boyfriend and his two best friends. A dedication ceremony for the departed brings up untouched memories and guilt as Quinn tries to make sense of her emotions and make amends in her old hometown. I loved McNear’s writing easy-going writing style. She makes the lake sound extremely beautiful and tranquil, despite the tragedy that happened on the frozen-over lake. Quinn was a likeable enough character, although I never really understood why she felt so guilty for what happened between her and Tanner or between her and her former best friend Gabriel. The small town did carry a lot of secrets, a lot of secrets that everyone presumes lead to the death of Tanner Lightman, each person finding their own version of guilt and responsibility for his death. Although its #6 in a series, it seems to be a stand-alone title. 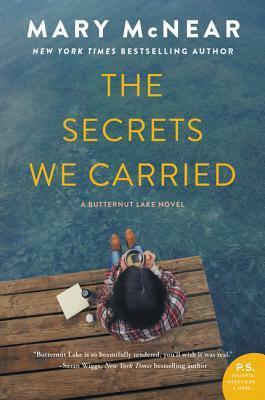 This entry was posted in Books and tagged Book review, butternut lake, fiction, mary mcnear, the secrets we carried. Bookmark the permalink.